Solar Energy is ideal for a country like India which has plenty of sunshine with well over 300 average annual sunny days. A successful design involves accurate knowledge of daily electrical load calculation and accounts for all worst case scenarios which might possibly occur during operation. A good designer will be pragmatic and keep the costs down by cutting on unnecessary over sizing the system. In the example of a typical middle class home (shown at the left) all the lights have been replaced with LED lights which consume far less electricity compared with the usual CFL lights or tubelights. This lowers daily power consumption which enables you to manage with smaller solar PV system. It would have been still better if the fans were also replaced with energy efficient fans. In India, Crompton Greaves will soon begin offering 1200 mm ceiling fans (MAXIMUS) that will consume just 35 watts!! The production is expected to start in March-April 2013. USHA has a 45 Watt ceiling fan (Technix). If such fans are installed the PV system size will be further reduced (which means still lower investment!). For energy efficient fans, please check out this page on Super Fans: Super Efficient Fans. it was pointed by a reader commenting below. The first step in designing a solar PV system is to find out the total power consumption in watt-hours. It involves multiplying the wattage of each appliance with the number of hours it runs daily and adding them all. The side image shows how it can be done. We shall use it as an example here. So, the total daily power consumption is 4300 wh. Besides solar panels which generate photocurrent, a solar PV system is made up of many components – charge controller, inverter, batteries – all connected by wires. None of these are 100 percent efficient. For instance, every 100 amp-hour drawn from the battery requires putting in about 115-120 amp-hours of charge into it. Inverters are typically only 85 percent efficient and likewise for charge controller. Cables offer electrical resistance to the flow of current which is substantial because of rather low DC voltages involved. People try keeping it low by working with higher DC voltages where possible and yet keep wiring cost and resistance losses low (say less than 3%). Therefore, in order to account for all such losses the modules must put in some extra energy into the system; not merely the daily watt-hour load. We can guess this extra amount if we assume say 80% efficiency for the inverter/charge controller, 85% for the battery bank and 3% wire losses. Thus, we must over size the requirement from the modules by 1/(0.80 x 0.85 x 0.97) or by 1.51 or simply 1.5. So, energy needed from the modules for our example house is about 4300 x 1.5 = 6450 wh. During the daylight hours modules must produce at least this much energy. This brings in the concept of “peak sun hours” into the picture. Since solar modules are characterized for 1000 W/m2 (1 kW/m2) of solar radiation intensity, it is useful to represent the daily solar radiation in terms of “number of hours” of 1000 W/m2. Thus, a 5 kW/m2 of daily average solar insolation is equivalent to 5 hours of 1000 W/m2 solar intensity. Monthly averaged daily solar insolation data (maps and data in Microsoft excel worksheet) are available from the MNRE website for Indian locations. These daily “sun hours” help you figure out the peak watt requirement from the panels. 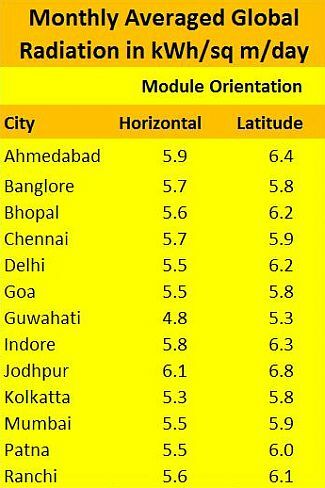 For example, in New Delhi the number of average daily sun hours is 5.5 for modules mounted horizontally and 6.2 when the modules are mounted at the latitude angle of Delhi which is about 28 degrees. Although modules should be ideally inclined at the latitude angle facing south in India (so that sun rays fall normally on the solar modules), but the table at the left shows the difference is not highly significant. A good way to harness the maximum solar energy from the modules is to change the angle of inclination twice during an year – in March for summer angle (generally 15 degrees less than the latitude) and in September for winter angle (typically 15 degrees more than the latitude). This can be easily done for small systems. If the house is located in Delhi, we can assume 5.5 hours of daily sunshine. So the peak watt rating of modules for our system will be 6450 / 5.5 = 1173 Wp – rounding it up, 1.2 kWp modules will be required. If you want to be more liberal use 5 sun hours; it gives 6450 / 5 = 1290 Wp or 1.3 kWp. Thus, there is no rigid formula for system designing; the only thumb rule is to be “somewhat liberal” depending upon your pocket size. For most locations in north India, one can assume 5 – 5.5 daily sunshine hours. An inverter is used in the PV system when 220V-AC power output is needed. Its rating should never be lower than the total watt of appliances and input DC voltage (12V/24V/48V) must match the voltage of the battery bank. The inverter size should be generally 25-30% bigger than total watts of appliances. If the load includes an appliance such as motor or compressor then inverter size should be minimum 3 times the capacity of these appliances so that it can handle the starting surge current for few seconds. For example, if total wattage all appliances is about 500W (as is the case in our example home), the inverter size should be around 650W. The battery bank should be large enough to provide the desired backup. Battery capacity calculation involves accounting for battery losses (typically 15 percent), maximum allowable depth of discharge (DoD) and days of autonomy. Although the deep cycle batteries can be occasionally discharged up to 80 percent, but for longer life it is better to keep the routine discharge limit to only 50 percent. Given the unpredictable nature of PV systems, once in a while batteries pay visit to the 80 percent limit of DoD. Not all the energy generated by the panels will be stored in the batteries. Some part of the daytime load will receive power directly from the panels through the inverter (power conditioning unit). What is not consumed will be diverted to the batteries. Let’s assume that for average 5.5 hours daily the working appliances receive power directly from the panel through the inverter. 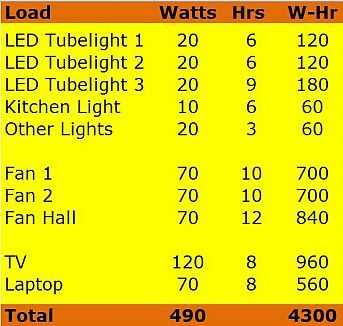 In summer months, it can be assumed that for 5.5 hours all the daytime load of fans, TV and the laptop receives power from the panel; this is 400W for 5.5 hours or 2200 wh. Thus, energy only for the remaining 2100 wh (of the total daily 4300 wh) needs to be stored in the batteries. Now again we must account for efficiencies of batteries’ discharge and inverter/charge controller: 1/ (0.85 x 0.80) = 1.47 (or simply 1.5). Thus, the storage required is 2100 x 1.5 = 3150 wh. This much stored energy will be drawn daily from the batteries. In Delhi the temperature goes down to 3˚C in the winter. Inside home where batteries will be located is expected to be around 10˚C. Battery capacities are generally rated for 25˚C. So a drop of 15˚C will reduce the battery capacity by about 10%. Applying this correction: 3150 / 0.90 = 3500 wh. If the system is designed for DC 24V, then the daily amp-hour capacity needed is 3500 wh / 24V = 146 Ah. For 50% allowable discharge we get 292 Ah. Therefore, a 24V 300 Ah battery bank should provide sufficient backup. Designing a solar PV system involves first calculating the average daily energy consumption in watt-hours. As a simple rule, overrate the daily Wh load by 1.5 for panel capacity. Likewise overrate Wh load to be stored in the batteries also by 1.5 for battery sizing. For better accuracy of design get the actual efficiencies of the charge controller, inverter, batteries and cables to be used. Maximum daily energy consumption is 4300 Wh. Maximum allowable load at any point of time is 500 W.
When fully charged, the battery bank can support the daily usage of 4300 Wh. Charge depletion of the batteries will be replenished on a clear sunny day. AN EXERCISE: Try calculating specifications of a solar PV system for a factory floor that uses 50 CFL lights of 20W each. These lights are to be run for 12 hours every day and in the 12 hours of night 17 of these lights will remain ON. What happens if you replace all these lights with 12W LED lights. These are again AC load like the example used above. You can share your calculations through the comment box and discuss difficulties. I am a firm believer in healthy people (mind and body both), healthy societies and healthy environment. Please feel free to comment, share and broadcast your views -- I like rational and intellectual discussions. Thanks for stopping by. Have a Good Day! This entry was posted in Solar System Design and tagged basics of PV system design, battery sizing, daily peak sun hours, daily sun hours, designing solar PV systems, panel sizing, peak sunshine hours in India, PV system design, sizing solar PV systems, Solar PV system design, solar PV system sizing. Bookmark the permalink. Good article on PV systems capacity and other factors to think about. Any idea if CG Maximus fans are available now or delayed. I am not able to find anything about the same from their website. The Maximus model was supposed to have been in the market in April 2013, but probably it has been delayed. There is another one called superfan, which consumes 35 watts at top speed (22W on speed 4, 14W on speed 3). And it works at full speed even on low voltages and comes with a remote. It costs around Rs 3000 (X1=2900 A1=3200 V1=3100). They say you can save around Rs 1000/yr with replacing a 16-20 hrs running normal fan. Of course, replacing becomes obvious when purchasing solar panel, otherwise the extra cost would go in the panel, by replacing you get a new super fan at the same solar invesment. Thanks Sukumar, for adding value to the article. I invite readers to share such useful information which are about innovation or energy saving. PS: their info@ and sales@ parasgreen.com email addresses are not working but they replied via their gmail address. It also costs Rs 3000 (without tax) but they offer no tax if purchased with solar panel. And I guess it directly runs on solar/mains in without battery condition. But, I have purchased a superfan (X1 model, 230v AC) and it is really a super fan. Though superfan doesn’t run on direct solar, they have a 24v DC version (Rs 500 extra). SuperFan seem to have 2 new models X7 and V7 with lower prices (about Rs 400 less) than models X1 and V1, probably the reason being that they don’t come with remote(X7 is Rs 2521 and V7 is Rs 2715). And I guess speed control is done via the main switch (turning on/off the switch multiple times quickly), I read this somewhere on their site a while back, probably on comments page. Of course it remembers the last speed, so there is no extra work if you use the same speed mostly. Thanks for the article.But what about the charge controller? I reckon charge controller has to be there between panel and batteries. Inverter will be used when we use electricty from the battery. So how do we design charge controller, put differently, what should be the capacity of the charge controller?? I have read something about mppt charge controller but do not know how to pick a correct size. Global Warming: Can Paris Climate Summit Limit Temperature Rise to 2 Degree Scenario (2DS)?